1. Updated to support the latest iOS 9.1 and iTunes 12.3.1. Click below buttons to spread a word on this freeware. AnyTrans is an emphasized and complete iOS content manager software. It gives both control and freedom over all users iOS data and files, including music, videos, photos, messages, books, Safari history, voicememo, etc. PhoneClean gives you an option to clean App caches, cookies and off-line files; sweep off media temp files and reclaim Other storage space on all your iOS devices with one single tap. World's first and only iPhone Cleaner tool! 1. 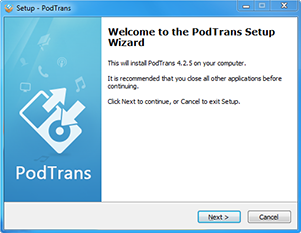 Free Download PodTrans setup file and click 'Run' to start the installation. 2. PodTrans is 100% clean and safe. 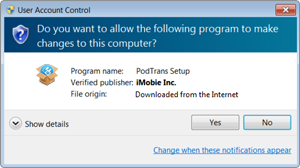 So when User Account Control asks for permission, please click 'Yes' to allow PodTrans to make the change. 3. 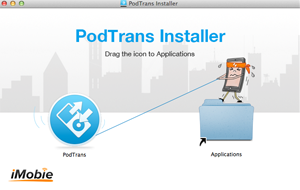 And then, you can follow the installation instructions given by PodTrans installer. 1. Free download PodTrans dmg file and double-click it to start the installation. 2. 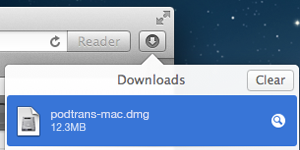 Drag the PodTrans.app icon to your Applications shortcut. 3. PodTrans is now installed! Open it on your Launchpad or keep it in dock for quick launch.